The Atlantic hurricane season is officially from 1 June to 30 November. There is nothing magical in these dates, and hurricanes have occurred outside of these six months, but these dates were selected to encompass over 97% of tropical activity. When the Weather Bureau organized its new hurricane warning network in 1935 it scheduled a special telegraph line to connect the various centers to run from June 15th through November 15th. Those remained the start and end dates of the 'official' season until 1965, when it was decided to start at the begining of the month of June and run until the end of November. 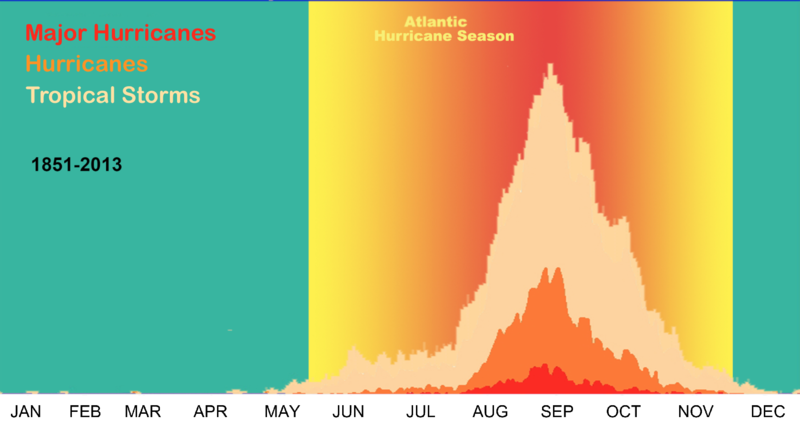 The Atlantic basin shows a very peaked season from August through October, with 78% of the tropical storm days, 87% of the minor (Saffir-Simpson Scale categories 1 and 2 hurricane days, and 96% of the major (Saffir-Simpson categories 3, 4 and 5) hurricane days occurring then. Maximum activity is in early to mid September. Once in a few years there may be a tropical cyclone occurring "out of season" - primarily in May or December.